A vigorous call-to-arms to reignite American citizenship at home and restore American power abroad, using the timeless truths of Teddy Roosevelt’s iconic “Man in the Arena” speech, by the Fox News contributor and decorated Iraq and Afghanistan war veteran. Pete Hegseth makes an impassioned and experiential argument for how Teddy Roosevelt’s articulation of “good citizens,” “equality of opportunity,” and unapologetic U.S. leadership—“good patriots”—can renew our imperiled American experiment and save the free world, in this fascinating, first-hand challenge to elite progressivism, ahistorical foreign policy, and status-quo politics. Despite contention surrounding Teddy Roosevelt’s legacy, Hegseth argues that the Rough Rider’s exhortation serves as a timeless wake-up call for our Republic. Hegseth resurrects Roosevelt’s famous “Citizenship in a Republic” address—best known for the “Man in the Arena” quote—as a roadmap for addressing the massive challenges facing America today. In order to rejuvenate what makes America exceptional, we must unapologetically get back into Roosevelt’s arena—as engaged “good citizens” at home and powerful “good patriots” in the world. Bolstered by gripping personal experience, Hegseth channels Teddy Roosevelt’s words to make a case for turning America’s highest ideals into action through the gritty virtues of citizenship, the dogged pursuit of equal opportunity, and aggressive commitment to winning the wars we fight—including the Iraq War. An exceptional American experiment was entrusted to “average citizens” in 1776 and has been perpetuated by every generation since…until now. If we won’t fight for America, then what will we fight for? And if not now, then when? Get in the arena! Pete Hegseth is a FOX News contributor who regularly appears on FOX & Friends, The Kelly File, and Outnumbered. An infantry officer in the Army National Guard, he is a veteran of Iraq, Afghani­stan, and Guantanamo Bay who holds two Bronze Stars and a Combat Infantryman’s Badge for his time overseas. He is the former CEO of the veterans advocacy organization Concerned Veterans for America and former Chairman of the pro-victory organization Vets for Freedom. He is also a graduate of Princeton Uni­versity and Harvard University’s John F. Kennedy School of Government. He writes regularly for National Review and FOXNews.com and is a term member of the Council on Foreign Relations. "With America’s free society being strangled by progressives and bureaucrats at home and America’s leadership assaulted by Islamists and globalists abroad, Pete Hegseth lays out a citizen-led roadmap for rejecting decline and forging another American century." "Pete Hegseth has written a contemporary update to Theodore Roosevelt's iconic "man in the arena" speech, one that makes for insightful and important reading." 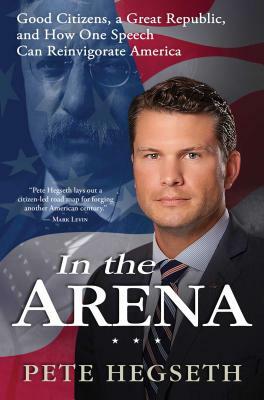 "Pete Hegseth has written an impassioned, wide-ranging book that is a rallying cry for engaged patriots to get in the arena, where we belong." “Pete Hegseth tells the hard truths about what American needs, at home and overseas, to make the 21st century an American century. A must-read for patriots who want to fight for a free and strong America." "A compelling book from a rising star. Pete Hegseth has faced the enemies of civilization in Iraq and the enemies of democracy in Washington, and his personal journey has led him to demand practical steps to put our country on course toward 'a more perfect union' again. In an age of fluff, Hegseth delivers substance: a stand-up work from an upstanding patriot." "Be careful picking up this book, because it will motivate you to take action. This book grabs you by the shirt collar. Pete Hegseth makes an impassioned and informed case for a tough-minded foreign policy as only he can. Pete already went to war for us—read In the Arena and find out why." "A wake up call from an American patriot, soldier, and father that our nation's greatness depends on each one of us getting into the fight."